Our “Merchants We Love” series appreciates those who generously contribute to the success of our tours, by hosting our wonderful guests week after week. We feel they give special meaning to “City of Angels”, and we hope you enjoy getting to know them better. Anoush Ter Poghossian is the lovely, third-generation owner of Mignon Chocolate which her family founded originally as a bakery in 1910, in Ukraine. Since the 1970s, Mignon has been known as “The King of Chocolate”, since their sweets were the favorites of the King of Iran and his family. Our Old Pasadena tour guests are now among those who enjoy the royal treatment, as Mignon is very much one of our sweetest tour stops. Our favorite lady chocolatier was born in Iran of Armenian heritage. She moved with her family to the US in 2000, for the joy of freedom and to pursue higher education. Today, her warmth and hospitality make every visit (1st, 31st, 101st) to Migon Chocolate incredibly special. I loved our conversation recently which - yes - was accented with chocolate samples! What is your earliest memory of chocolate? I remember when I was about 3 or 4 and I would go to the (family’s) chocolate factory. It felt like a Willy Wonka experience, can you imagine? A child at a chocolate factory! I loved sticking my finger in the (liquid) chocolate to taste it before it was put in the molds. Joe (partner in Mignon business; one of three brothers) and I were the ones that loved this the most, we could walk to the factory from our home. Now, Joe’s daughter who is 3, loves to be at our factory and taste the chocolate! She puts gloves on and knows just where the molded chocolates go on the trays and in the boxes. She’s also very particular about her chocolate. When she tastes a commercial chocolate, it just doesn’t taste right to her! In your family and culture, are there holidays where the tradition is primarily chocolate? Christmas and Easter are holidays where chocolate is popular. The Persian New Year is in March, around the first of spring, and that is a big holiday for chocolate. And weddings are now becoming huge occasions for chocolate! You bring such joy and passion to your business. What is your favorite aspect of being a lady chocolatier? It’s really fun to make people smile. You should see how their faces change with every bite of a chocolate! It’s really fun to watch them become so happy with just a taste. They say that women love chocolate and diamonds. Women eat more chocolate than men, and men know that women love chocolate, so that all makes it very easy to sell our products! You are recently married. Do you cook at home? Do you bake with chocolate? We were married in June and 280 of our closest friends and family were there! My husband likes being at home for dinner, so I cook almost every night. We eat a lot of traditional Persian and Armenian dishes. My favorite is Ghorme sabzi, a green stew with greens, meat, lemon, kidney beans, and rice. My family had the pastry shop in Iran, so my mother never really baked because all the desserts we wanted were right there. I really don’t bake, but I do enjoy cooking! 3 favorite guilty (food) pleasures? Chocolate. I eat 2 pieces every day! Ice cream. I love Pinkberry’s Pomegranate flavor. Where do you love to dine out? We love sushi, and Katsu-Ya on Ventura Blvd is one of our favorite places. We love to sip sake, and enjoy the ambience there. 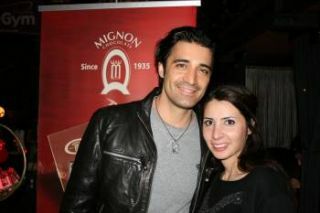 A little about your fans ... Gilles Marini*, one of my favorite men in the world, is one of your celebrity fans! What other celebrities are Mignon fans and which are your favorites? Chris Harrison of The Bachelor. Antonio Sabato Jr’s girlfriend is very nice! Adam Sandler, he is very nice and always has our chocolates at his parties, and I believe his personal chef is Armenian! We’ve had our chocolates at parties for the Lakers, and also Arnold Schwarzenegger. Some Dancing with the Stars people are also fans. Christine Devine of FOX 11 News is one of our very best customers, and my favorite! *note: Without prompting, Anoush offered the photograph to be used for this story! What are the latest, greatest, most exciting thing(s) at Mignon that fans - celebrity and others of us - need to know about? We are expanding by now making our chocolates available wholesale in bulk, for resale. We’ll have our autumn seasonal flavors soon - pumpkin pie, egg nog, and cinnamon for Christmas. We also sometimes develop flavors for our customers if they make suggestions that we can make into a delicious chocolate. It’s so fun to see their response when we say that their idea has now become one of our new flavors! Night owl or morning person? Night owl, I’m definitely not a morning person! Favorite music to work by? Italian music! Quick words of advice to aspiring chocolatiers? Keep customers happy. Listen to their suggestions. It was pure pleasure to spend time among chocolates to enjoy this one-on-one time with Anoush! In closing, I can only say that I adore her passion, and especially her joyful contribution to making the world more beautiful. Anything that creates more smiles on faces deserves applause, and sincere appreciation! Mignon Chocolate has two retail locations, in Old Pasadena and Glendale.